Welcome Art Lovers to the Pleasures of Slow Looking! Arthur Blumenthal, Ph.D., an international museum consultant and Renaissance scholar, and his wife, writer and artist Kären Love Blumenthal, have a passion for art. Through workshops and trips, they teach students the joys of "slow looking," a technique they developed for art viewing. Their firm, Loving Art Partnerships, offers a range of services for museum professionals and art aficionados of all levels. Arthur and Kären lead groups to Rome, Naples, Florence, Paris, Spain, and the Netherlands. Awarded the Lifetime Achievement Award by the Florida Art Museum Directors Association and named "Orlando's Best Museum Director" on three occasions, Arthur is the director emeritus of the Cornell Fine Arts Museum at Rollins College in Winter Park, Florida and served as Guest Curator for "In the Light of Naples: The Art of Francesco de Mura" an historic exhibition organized by the Cornell that traveled in the U.S. Kären Blumenthal is a visual artist and writer. She is currently working on a television series about famous art masterpieces now in development. Loving Art is thrilled to announce that Kären Blumenthal is spending the summer at McRae Art Studios while Arthur works on a cutting-edge digital catalogue raissoné for the great Golden Age painter, Francesco de Mura. It just doesn't get better than this! Loving Art joined other art lovers for an art-packed trip to New York in April 0f 2017 to attend the opening of In the Light of Naples: The Art of Francesco de Mura at Vassar College's Frances Loeb Art Center. Great opening at Vassar, then traveled to the City and joined friends for a week of museum-hopping and theatre. Great fun: Arthur spoke at Christie's on April 25 ... loved introducing New Yorkers to the great Golden Age master. Congratulations to our Loving Art Partnerships creative partner, Sopranos star and distinguished collector Federico Castelluccio, who discovered this magnificent Guercino masterpiece in a dusty auction house in Frankfurt. Federico, who owns America's largest collection of Francesco de Mura paintings, is lending four works to the upcoming show, In the Light of Naples: The Art of Francesco de Mura. Famous for his role as the mobster "Furio" in the Sopranos, he is also known as an accomplished artist who paints in the Old Master style. Loving Art applauds Federico's uncanny ability to spot undetected masterpieces in unlikely places! PLEASE NOTE: Due to our 2016-2017 schedule that includes a television project, and an international Baroque art exhibition, In the Light of Naples: The Art of Francesco de Mura, all workshops and European art tours will resume in 2018. Please stay in touch with us! Here's an illustrated path through our "How to Look at Art" course. We've now taught the course to over 2,000 people in the U.S. and Europe in the great museums of the world. Artist Grant Snider must be reading our minds. A big thank you to him for this. Join us as we follow in the footsteps of Baroque master Michelangelo Merisi da Caravaggio in Rome May 13-24 2014. This will be slow looking at its best! Study his magnificent masterpieces up close! Spend a full week with Arthur, a noted Renaissance scholar, and a full day with Frank Dabell, an Italian Caravaggio scholar. * You will enjoy six nights in the heart of Rome, hot breakfasts, a luxury coach at your disposal, two wine and cheese art art salons, and free admission to all museums. A suggested reading list will be provided before the trip. 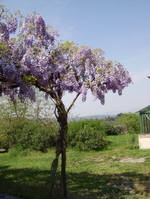 Italy's beautiful Pio Monte della Misericordia was the scene for another Loving Art presentation on the great artist Francesca de Mura on October 23, 2012. 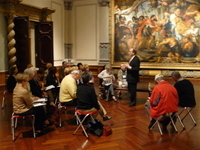 Arthur's talk, "In the Light of Naples: Francesco de Mura in America," was warmly received by the Neopolitan art lovers. A big thank you to Maria Gracia Leonetti and the entire wonderful Leonetti family for their hospitality! Pio Monte is famous for its gorgeous Caravaggio painting, "The Seven Acts of Mercy." Loving Art has made De Mura presentations at the Italian Cultural Institute of New York and at the Italian Embassy in Washington, D.C. Took a wonderful group of art lovers for "How to Look at Art in Paris" on October 13-21, 2011, then stayed another week alone. We began at the Hotel Lotti just minutes from the Louvre, traveled to Giverny, Fountainebleau, Versailles, then oggled the art treasures of Musee d'Orsay, Musee de L'Orangerie, Musee Rodin, Centre Pompidou, and many more! See our full itinerary at Download ParisTrip . Thanks to our fabulous students, our Institute of Culture travel agent, Harriot Roberts, Brendan Tours, and our brilliant French guide Regine Rousseau! HOW TO LOOK AT ART! A Course with Arthur Blumenthal, Ph.D.
"Slow looking, like slow cooking, may yet become the new radical chic." PLEASE NOTE: Due to our 2016-2017 schedule for the exhibition,"In the Light of Naples: The Art of Francesco de Mura," all European workshops and art tours are on hiatus and will resume in 2018. Look for updates on this website. Stay tuned! 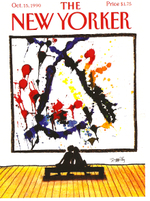 Our fun, transformational HOW TO LOOK AT ART! 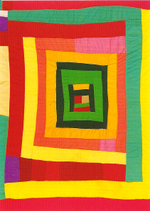 workshops are now offered in one- or two-day formats in major North American museums. Developed after decades of watching viewers struggle with art, Arthur Blumenthal's method embraces slow looking, meticulous description, humor, and insightful thinking using the viewer's own visual powers. Here, a student points out a detail to Arthur at the magnificent John and Mable Ringling Museum of Art. Loving Art Partnerships continues its outreach in Florida, New York, Paris and Rome through 2015. A special version is also available to physicians and corporate executives. 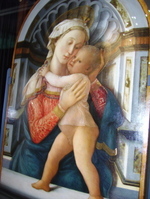 For more information on all courses, including European art tours, please e-mail lovingart@cfl.rr.com. HOW TO LOOK AT AMERICAN ART TREASURES! HOW TO LOOK AT ART IN PARIS! Mark your 2009 fall calendar now! This fall, we'll be at the National Art Gallery of the Bahamas in Nassau, the premiere art museum in this tropical paradise. Join us for an exciting two-day How to Look at Art immersion slated for October 16-17, 2009. We'll post details of our complete fall schedule soon. We couldn't think of a better place to spend the 8th anniversary of 9/11 than a great Florida art museum. Here, Rebecca Nagy, director of the Harn Museum of Art at UF, with Arthur as she escorted us through the galleries of one of Florida's finest and fastest-growing museums. The Harn is one of the ten largest university art museums in America and a new three-story Asian art addition will be opening next year. Kudos to Rebecca for outstanding work and UF for supporting her! (UPDATE: October 26, 2009 Brandeis President just resigned after months of conflict over this matter) The Rose Art Museum at Brandeis University, one of America's best, is in danger of being closed. Worse, its magnificent art collection may be sold. This does not bode well for the nation's college and university art museums. Join the American Association Museums and Loving Art Partnerships with your voice of protest. Go to savetheroseart.org today and show your support. Thank God America's great museums are included in the recovery program for the economy. From Feb. 23-24, nearly 300 museum professionals from 43 states—descended upon Washington for Museums Advocacy Day, a comprehensive, concerted effort for museum professionals to make their case on Capitol Hill. After a day of intense advocacy training on the 23rd, these citizen-lobbyists hit the halls of Congress, meeting with the majority of Senate and House offices. For more information, go to the American Association of Museums. Let's Look at Contemporary Art in Jax! In an informal, fun atmosphere, art lovers learn an exciting way to look at contemporary art thoughtfully and without intimidation. “Dr. B’s” simple method encourages students to look mindfully and confidently, drawing on their own imaginative powers. Over 1,000 students have enjoyed this class in American gallery settings on on European tours since 1988. the popular workshop is now offered in major art museums throughout north america and canada. Dr. Arthur Blumenthal is an international museum consultant, popular art educator, Director Emeritus of the Cornell Fine Arts Museum at Rollins College and 2007 recipient of the Florida Association of Art Museum Directors Lifetime Achievement Award. Joie Vive at the Leepa-Rattner in April! Join us at this distinguished Florida museum on April 18 from 9 a.m. to 4 p.m. in Tarpon Springs surrounded by the vitality and joie vive of works by abstract impressionist ABRAHAM RATTNER, one of the mid-20th century's celebrated painters. HOW TO LOOK AT ART offers a way to look at a single work of art for a profound aesthetic experience. We teach students to deeply see, outside of any knowledge or art history, using their eyes and insights alone. Our five step method, while simple, produces powerful results: 1. Stepping into the Looking Space 2. Our Instant Impression 3. Entering the Fresh Mind 4. The Uninterrupted Gaze (Meticulous description) 5. Seeing the Whole This course is based on ARTHUR'S "How to Look at Art," taught at Rollins College to over 1,000 adult students for nearly 20 years. KAREN'S workshops, concerned with writing about art, also shape the course. What a marvelous time we had with our beloved friend, (this is a mouthful) Maria Grazia Leonetti di Rondino and her sister, Lisi, in early December on their Florida visit! She's the "Angel of Naples" who is the first female Governatore of the Il Pio Monte della Misericordia the famous Neopolitan charity. Like Arthur, she's a lover of Francesco de Mura, the great Italian Baroque painter. 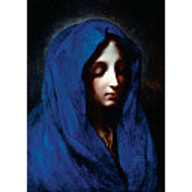 The artist bequeathed his works to the Pio Monte in the 18th century to feed the poor. The Charity also owns several Carravagios, including the magnificent The Seven Mercies. Maria Grazia and Lisi got to see the De Muras at the Ringling Museum and the Cornell Fine Arts Museum at Rollins College. A radiant addition to the Met's Renaissance galleries, this beguiling Madonna and Child by Cosimo Rosselli is a familiar old friend. We stopped by to say hello on our November New York trip. If you recall, Rosselli is the Florentine artist Arthur brought to life with his international exhibition, "Cosimo Rosselli: Painter of the Sistine Chapel" in 2001 at the Cornell Museum in Florida. A second show is in the works in Florence, details TBA. Speaking of NY, our great thanks to art-lovers and great friends June Hunt-Mayer and George Elkins for the most memorable New York trips so far! Renewal vows in Central Park, champagne reception at June's apartment, a splendid co-birthday party for Kären and Clifford days later. What hospitality! We love both of you! Rarely do we visit an exhibition more than twice, but this November jewel at the Met called us back three times! Congratulations to our friend Renato Miracco, director of the Italian Cultural Institute of New York, for his recent curatorial triumph, "Giorgio Morandi 1890-1964" highlighting this 20th-century master of landscape and still life paintings. The contemplative, quiet, rich exhibition attracted huge crowds, surely as large as the Van Gogh at the MoMA. Morandi is an intriguing artist (echos of Chardin) who spent a solitary mid-century life meditating shape and form. Sr. Miracco, with friends and scholars of Morandi, breathed new life into this "artist's artist." Our heartfelt thanks to Maria Grazia Leonetti di Rondino, Governatore, Il Pio Monte della Misericordia, for her warm hospitality and enthusiasm for the great Baroque master Francesco de Mura. And gratitude to the Ringling Museum for sponsoring this research trip. You see here Sorrento, where Arthur stayed with Maria Grazia at her vacation home. And thanks to brilliant Loredana Gazzari and her Mom and Dad, for taking Arthur under their wings on this busy trip. It was a delight to spend time with the distinguished Nicola Spinosa, head of all Neapolitan museums, and see his energy and excitement about curating a first-ever Francesco de Mura exhibition in Naples. We also thank the priests, curators, and volunteers in the churches and museums who searched out De Mura's works. Naples is a fascinating city, jammed with magnificent art, colorful people, lots of noisy, friendly chaos and delicious food. In its Golden Age, the 1800s, our artist De Mura created his masterpieces. Naples was then the heart of European culture. We bid a bittersweet farewell to our great friend and colleague at the Ringling Museum of Art, Stephen Borys, who accepted the directorship of the prestigious Winnipeg Art Gallery Canada's oldest art gallery, effective in mid-June. As Ringling's Ulla R. Searing Curator, Stephen was Arthur's partner in the creation of the upcoming Francesco de Mura exhibition. Don't worry, the show may still make it to the Ringling, (or another Florida venue), but will likely originate outside of the State. The selected venue will be announced later this year. In the meantime, we wish Stephen and his beautiful wife, Hazel, and little son, Roman, great things in Winnipeg. He's a true professional and they're lucky to have landed him! Ringling Students Learn the Art of "Slow Looking"
Twenty-one students (25 counting staff) submerged themselves in art for the fabulous "How to Look at Art" two-day immersion into the masterpieces of the magnificent John and Mable Ringling Museum of Art Feb. 14-15, 2008. The art-lovers embraced "slow looking" and conducted marvelous, creative, lively presentations. This was one of the most enthusiastic groups we've worked with! We'll be posting photographs and comments about the workshop shortly, so stay tuned. We want to thank the Ringling staff, particularly Maureen Z. for their professionalism and great support. We loved working with every one of you! 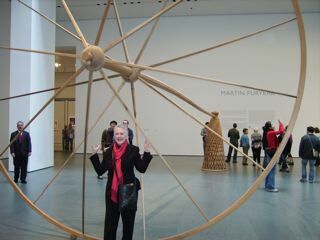 Loving Art Partnerships just returned from an art-filled Christmas week doing research in New York. The Rockefeller Center tree twinkled below our hotel window! On December 21, we officially launched LAP at the home of irrepressible art lover June Hunt-Mayer with a beautiful dinner party (Thank you George Elkins! Thank you, too, Mary Jane Harris!) At the MoMA, we wandered through the Seurat show with great friend and collector Robert Rothschild (who has two works in the show), then we visited the Whitney, the incomparable Frick Collection, and of course, the Metropolitan Museum where the splendid Baroque tapestries dazzled the eye. We buried ourselves in research at the Frick Art Reference Library sorting through boxes and boxes of Francesco De Muras and others. By the way, a stunning De Mura painting was discovered in a collector's home (it will go in the Ringling show) and Christie's and Sotheby's were helpful in tracing even more. HAPPY NEW YEAR TO ALL! Give yourself a Valentine! Let Arthur Blumenthal, distinguished Renaissance scholar, teach you to look at art treasures with your eyes, mind, and heart. In an informal, fun atmosphere, art lovers will learn a way to look at art thoughtfully, and creatively---without intimidation. “Dr. B’s” simple method encourages students to look mindfully and confidently drawing on their own imaginative powers. Over 1,000 students, beginning and advanced, have enjoyed this class in American gallery settings and on European art tours since 1988. Art lovers can achieve profound aesthetic experiences by shifting awareness, becoming fully present and highly focused. Students will work in the Ringling Museum's beautiful new galleries and see famous gems like The Blue Madonna by Carlo Dolci (Italian: 1616-1687) pictured here. You'll also enjoy delicious lunches in the Museum’s Traviso Restaurant. Click on "Testimonials" in this blog's right-hand column for student comments from earlier workshops. For out-of-towners, the Ringling will provide a list of accommodations close to the Museum. This is going to be great fun and we'd love to see you there. The workshop will fill early, so to assure yourself a place, contact the Ringling Museum/FSU Cultural Institute at 941-358-3180 or e-mail the associate curator of education, Maureen Thomas-Zaremba. TALLAHASSEE, FLORIDA — The Florida Art Museum Directors Association is pleased to announce the recipient of the 2007 FAMDA LIFETIME ACHIEVEMENT AWARD is Arthur R. Blumenthal, Ph.D., Director Emeritus of the Cornell Fine Arts Museum, Rollins College, in Winter Park, Florida. 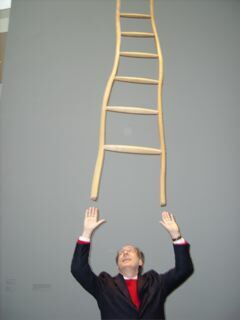 As stated in Blumenthal’s nomination letter by Ken Rollins, interim director, Tampa Museum of Art, “His academic contributions to the museum profession are unparalleled by anyone in the State of Florida.” Dr. Blumenthal has been a museum professional for four decades, beginning as a Ford Foundation Fellow at the Metropolitan Museum of Art in New York. The purpose of the FAMDA Achievement Award is to recognize outstanding professional achievement or extraordinary contributions to Florida’s art museums. Recipients must have served as a museum professional in Florida for at least five years or have served as a long-term contributor to the enhancement of the visual arts in the State of Florida. MARSEILLE, France (AP) - A woman has been arrested on suspicion of kissing a painting by American artist Cy Twombly and smudging the bone-white canvas with her lipstick, French judicial officials said Saturday. Police said they arrested the woman after she kissed the work on Thursday. She is to be tried in a court in the southern city of Avignon on Aug. 16 for "damage to a work of art," judicial officials said. 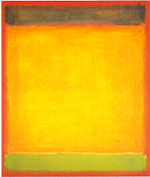 The painting, which is worth an estimated $2 million, was on display at the Museum of Contemporary Art in Avignon. It is part of an exhibition slated to run at the museum through Sept. 30. Officials did not provide further details on the painting. Twombly is known for his abstract paintings combining painting and drawing techniques, repetitive lines and the use of graffiti, letters and words. Our book and course, LOVING ART, is shaped from Arthur's course, HOW TO LOOK AT ART, a popular offering at Rollins College that has attracted art lovers since 1988. The course is a submersion into spirit and soul, into self-knowledge and joy. LOVING ART doesn’t teach art appreciation, art theories or techniques; it teaches confidence in our own visual powers. It’s about unrestrained joy in the act of looking. It's about accessing art’s mysteries unafraid, undaunted, valiant, and open. But LOVING ART offers more: it's a way of awakening, a way to live an inspired life, one filled with possibility and delight. Looking at art intelligently, deeply, and boldly can transform one's life. Art dissolves cultural differences, offering connection, compassion, and hope to this beleaguered world. When we view art consciously, as we teach our LOVING ART students, we bring vast imaginative powers to the moment. We gaze into another’s soul and, paradoxically, into our own. Barriers dissolve. Geography, time, language, and space vanish. The artist may live in Chechnya, or Bangladesh, or Wisconsin—or have lived centuries ago. Art illuminates, revealing what it is to be human. Art literally changes our brains. But first, we must learn to look, not carelessly, but mindfully and without trepidation. This course is based on Arthur's "How to Look at Art," taught at Rollins College to thousands of adult students for nearly 20 years. My workshops, concerned with writing about art, also shape the course. We promised a list of Italy's Ten Most Astonishing Works of Art and, here in mid-July, please know we haven't forgotten. Bear with us. We landed in the USA and turned around and took two more trips! One to Chicago (you'll see the Art Institute stuff here shortly) for the American Assn. of Museums conference. Then off to Boulder to see our godchild and niece,Charlotte, graduate from high school. Suffered a case of delayed jetlag until a few days ago. The Italy paintings are coming...we promise. But I'll post about art-filled Chicago first. As promised, here's Francesca Delacroix's living room. She's the Roman Pearl Mesta and art historian I mentioned earlier. Here is where she hosts elegant salons complete with 7-course homecooked meals! Francesca collects people, then mixes and matches them for memorable evenings. A drying rack in the little flat's living room. When I inquired why the Italians don’t have clothes dryers, a friend said: “Why, when they have the Mediterranean sun?” Throughout Italy, revolving lines display bright clothes-pinned shirts and tablecloths and napkins and linens rippling in the breeze. But mostly eat. Back in Rome now, just one more trip to Naples this Friday. This post is for my friends and wonderful chefs Mary Ann and Wendy in Florida, and George in New York. The Ghetto trattorias offer artichokes fixed every way imaginable. I love the “Roman style” served with olives and bread, and, of course, the fabulous Jewish artichokes, carcio fi alla giudia, crispy as potato chips. George, please tell your chef at Gusto’s (in the Village, NYC) that hers are still the best I’ve ever eaten! Another style: sliced paper thin with shaved parmesan. Here, the perfect eggplant and parmesan dish, brilliant in its simplicity. The Certosa di San Martino offers up a treasure trove of De Mura paintings and frescoes. The museum staff is friendly and helpful, copying their records and files for us. I snapped this in the wonderful, old church-turned-museum. Maria Grazia, (you met her earlier, she’s our friend from the Pio della Miseriacordia) met us later at the Nunziatella, an Italian military school where De Mura painted the chapel ceilings. Instead of pews, the chapel has row upon row of red velvet chairs. His work is so beautiful there, we shake our heads as to why he has never had an exhibition! The view is like a living poem. This is a dizzying ride, no? This is the third Naples trip hunting for De Mura’s elusive and lovely paintings. We’re striking gold. This view is near the offices of art historian Nicola Spinosa, who writes about Neapolitan art and was kind enough to direct us to more frescoes and painting. Sgr. Spinosa’s office is at the Certosa di San Martino, high above the city, the bay pale blue in the distance. With our great expat friends, Frank Dabell, a Temple University art historian and Jay Weissberg, film critic for Variety magazine. We're in a small trattoria in Trastevere. You’ll remember Frank, the witty Britisher who worked on the Cosimo Rosselli show in Florida with A. He’ll also work on the Florence show in 2008. Last week, Jay concocted our most delicious meal so far in the tiny kitchen of their flat in the Doria Pamphilij Palace. These two live (think of books to the ceiling, tile floors, a loft) the way you’d love to over here. I’ve fallen in love again with the dazzling Filipo Lippi whose brush outshines most of his peers. Found this beauty in the Florence City Hall in the Medici Palace. It sits in the lobby in a glass case. It just knocked me out. (I know, I know, I can’t believe they let me use a flash on it.) Felt guilty for about five seconds. I don’t know the words to describe this work—impeccable comes close. Arthur happily inspects this Florentine fountain designed by architect Guilio Parigi, the subject of his dissertation. The curvy fountain is perched just around the corner from the Cirolo Unione, our Florence home. Oh, I cannot leave Florence without a mention of the leather market. Here, you see a typical purse that sells for hundreds less than in the USA. The booths are manned by young British and French sales women and its tempting to buy up everything in sight! We browse through, checking out purses in every style, shoes, belts, bags and the like. Arthur, the strict vegetarian asks: What about the poor cows? We're back in teeming Florence after two days in the countryside. We walked the City, with Arthur finding his old apartment on a small, crooked street. We also found a fountain designed by Renaissance architect, Guilio Parigi, whom Arturo "discovered" for his Ph.D. We stopped for espresso at the Uffizi coffee shop and I snapped this pix there. Note the fabulous detail. Meanwhile, at the Circolo Unione, our headquarters, the Marchese continues his gracious hospitality and we enjoy lunch with him before boarding a fast train back to Rome. Nothing, nothing at home tastes as good as this! I can't figure it out. Maybe its the freshest, plumpest tomatoes harvested around the farm. Whatever it is, Anna, when not talking about art, produces dish after dish for us during our visit. Kudos to her for her great traditional cooking! A bedroom in the farmhouse. Just an hour from Florence is the tiny hilltown of San Miniato where the Gucci family launched their leatherwork artistry over a century ago. Anna and Vincenzo's farmhouse perches high on a hill on the outskirts of town. It's a dizzying ride through those hills with Vincenzo skillfully navigating the curves like a race car driver! The quiet in these hills is unlike any I've known. A stillness so deep and solid one can hear the wheat growing, the insects humming. Why do I think this is the way its supposed to be? Like fragments of a dream, these days linger as we return to the wild energy of the cities. From the farmhouse window: silvery, twisted olive trees, grape orchards, emerald wheat fields stretch forever. It’s one thing to see Italy’s great art; another to see the artists’ source of inspiration. Da Vinci’s depth of space—the tiny umbrella pines against the distant blue, well, there’s nothing like it in the world. I could look forever.